A key driver of pet industry growth is the aging of America. These tables show the percent of spending on each segment, and how that mix has changed over 5 years. Baby boomer spending trends are evident in the data as they purchase a larger slice of the $50 billion pie each year. Comparing older and younger demographic groups clearly highlights the direction of consumer spending on pets in the U.S. 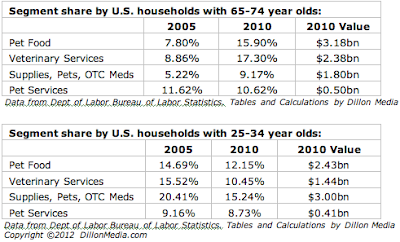 Many more of these tables, plus charts and analysis by Dillon Media, are available in the latest Pet Industry 2012 Strategic Outlook, dissecting the industry by age range, income bracket, family composition and region. This report is a great resource for companies that market to pet owners on a nationwide basis.